Built into a hillside that slopes down to a pretty lake, Phong Nha Lake House Resort will appeal to those looking for solid, modern accommodation in natural surrounds. Average rating 8.5 from 213 reviews. The bungalows and villas are well-equipped and well-furnished, with clean lines and cream-coloured walls jazzed up with wooden baseboard, a four-poster bed elegantly draped in mosquito net and framed art. While not the most cohesively decorated (we’re not fans of screaming pink fake flowers), the room is clean, new, tidy and comfortable and the bathrooms are modern and slick. Amenities include minibar, desk, air-con, WiFi and kettle, as well as a swimming pool, billiard table and free use of kayaks to explore the resort’s winning feature, the lake surrounded by low green hills. The eight lakeside bungalows are the best, low to the water and with sliding glass doors leading to relaxing balconies at the water’s edge. If you prefer being close to the pool and the restaurant/reception, the “villa” rooms wrap around the swimming pool. We weren’t aware they had a dorm room until we checked their website after our visit. According to information we later received by anonymous email, the air-con dorm has eight beds, price including breakfast. This is a great option for those looking for budget accommodation outside of town as Phong Nha Farmstay no longer has dorms. Phong Nha Lake House Resort is located on Ho Chi Minh Highway East, about seven kilometres from town, close to the turn off for Phong Nha Farmstay. 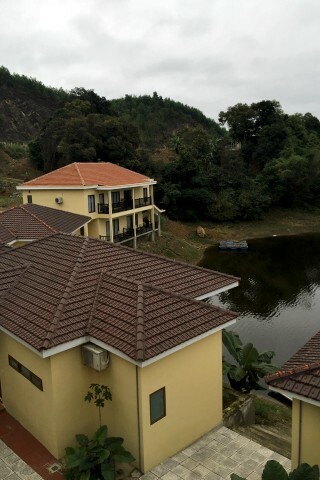 Check rates at Phong Nha Lake House Resort on Booking.com. Room: Family room, low season: US$70, high season US$70. Notes: Two queen beds.